Mini DisplayPort (MiniDP or CDM) is a miniaturized audiovisual DisplayPort digital interface version. The features and signals are the same. Apple Announces the launch of the Mini DisplayPort in October 2008. In 2013, Apple installs this port on all new Macintosh computers : MacBook, MacBook Pro, MacBook Air, iMac, Mac mini, Mac Pro. The Mini DisplayPort is also installed on mobile PCs from manufacturers such as Alienware (DELL), ASUS, Microsoft, Lenovo, Toshiba, MSI and HP. Unlike its predecessors, Mini-DVI and Micro-DVI, Mini DisplayPort is capable of supporting resolutions up to 2560 × 1600 (WQXGA). 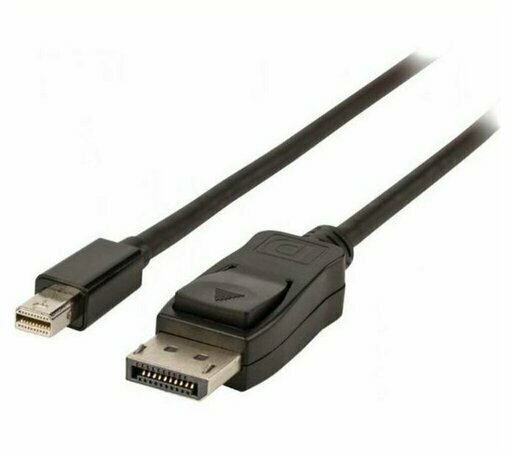 With an adapter, Mini DisplayPort can connect to the display with a VGA, DVI, or HDMI interface devices. The Mini DisplayPort connector, invented by Apple, is increasingly used, both in graphics cards (some models AMD and Matrox) in computers (Apple, of course, but also Toshiba). With the release of the Radeon 5870 EyeFinity and its six Mini DisplayPort connectors (expected March 11), return on this connection. The Mini DisplayPort is a smaller version of the DisplayPort. The video features are identical to those of the DisplayPort, but audio functions, however, are not available on all devices. There are several ways to connect a screen on a Mini DisplayPort plug : with a native screen, via an adapter (passive) to DisplayPort (and a screen to this standard), through an adapter to DVI (passive or active) or an adapter to VGA. There is a screen at Apple, the possibility of using an iMac 27 inches as a screen or a screen of Cinemaview. The simple alternative is to use an adapter to DisplayPort and plug a DisplayPort screen, rare and expensive. The most common priori solution is to use a VGA or DVI display. In the first case,. must be an active adapter (which transforms the signal). In the second, it is very dependent on the graphics card. DisplayPort (and thus the Mini DisplayPort) offers a DVI compatibility mode, which actually uses a DVI signal on a plug DP. But this signal must be sent from the graphics card through a TMDS, a component generating the signal. Small problem, apart from the fact that this mode limits the signal to a single link (1920 x 1 200), there are sometimes less than output TMDS. From AMD EyeFinity card should have only two compatible outputs. An active adapter will be required. Beware, they are expensive and require a USB plug for power supply. In fact, Mini DisplayPort began to democratize in devices, but views are still too rare.